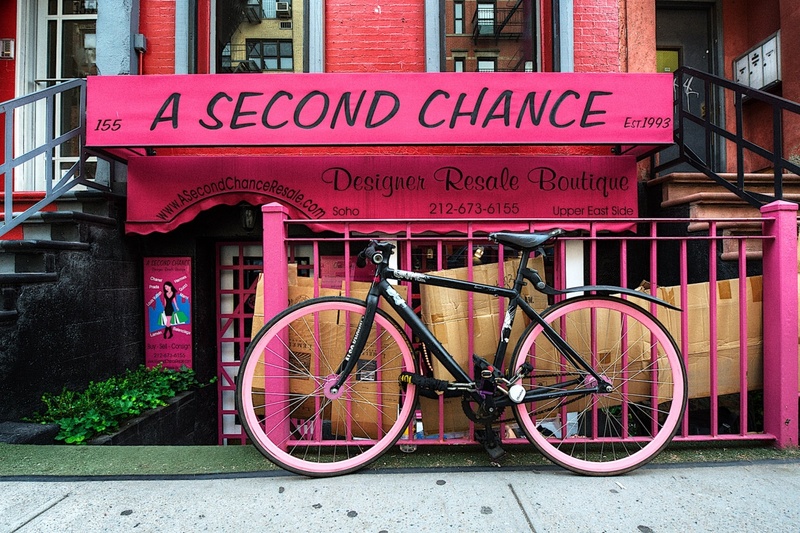 I have searched around a bit for any indication that this bicycle with its pink rims is a regular fixture at this storefront at A Second Chance Designer Resale Boutique on Prince Street in SoHo, but can find no such thing. If in fact the bike spends a lot of time chained to its color-matched location, then nobody has mentioned it on the web, or Google cannot find it. That is such a cool find. NY has incredible character, I can’t wait to visit! What a cool shot man! Sweet find! I lvoe it when I come across gems like this. Great shot. Wow no way of missing of that one huh. Awesome color. Nice find. Couldn’t pass this one up for sure. There’s sort of a, I can’t quite put my finger on it, a pinkish hue to this shot? A touch, perhaps? I love this picture, Mark! Great colors and details here, and the composition is spot on with perfect lines. Top drawer, my friend!